Marcus Law admitted Kettering Town were left “a bit shell-shocked” after a thrilling 4-4 draw with Redditch United at Latimer Park last night (Tuesday). The table-topping Poppies, who have been so solid for the majority of the season, struggled to cope with Redditch’s attacking threat and found themselves 3-2 down at half-time while goalkeeper Paul White saved a penalty. Rhys Hoenes missed a spot-kick for the Poppies after the break before two goals from Dan Holman turned the game back in their favour. But just as it looked like they were going to pick up a fifth league win in a row, Redditch snatched a deserved point with a goal from a corner in the final seconds of stoppage-time. Law conceded his team looked “lethargic” defensively and the draw saw their lead at the top of the Evo-Stik League South Premier Division Central cut to three points after Stourbridge picked up a 2-1 victory at Biggleswade Town, although Kettering still have two games in hand on their nearest rivals. 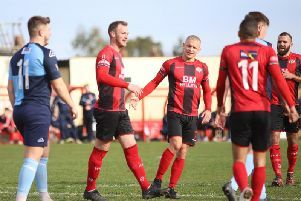 “As a side we looked pretty lethargic on defensive duties, we were not as solid and consistent at nullifying the opposition,” the Poppies boss said. “We got a bit too carried away in possession and we were vulnerable to the counter-attack. Two of their goals have come from that situation and the other is from a set-piece. “We sorted it out in the second half and it was a case of persevering and grinding it down. They defended resolutely, the goalkeeper has made some good saves and we missed a penalty. “But we got ourselves in front and then it became a case of seeing it out and there was a lack of concentration again right at the end. “We are bit shell-shocked that we have conceded four goals and it was certainly a game for the person sitting in the stand who spent their £10. The Poppies are back on home soil on Saturday when they entertain St Ives Town.